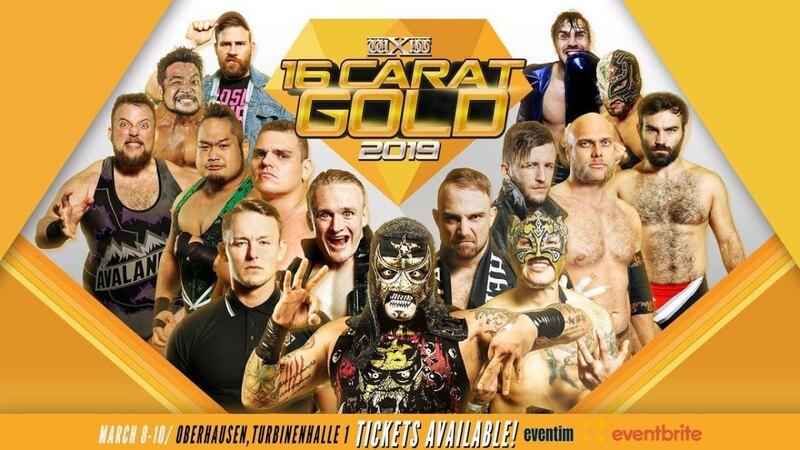 Over the past few years, each of the three nights of wXw's 16 Carat Gold tournament had a bit of a unique emphasis on how it was presented. Night one usually establishes the tone and showcases all participants as characters and workers. Night two is more angle-heavy with strong accentuation on storyline progression, surprises, and the story about the big World title match that has had months of build. Night three has big drama, unique matches, and opens a new chapter for how stories are being told over the following months. In that regard, night three of the 2019 tournament delivered perfectly. Hardly has a 16 Carat Gold tournament final ever been as dramatic, telling a story of hardship and how to overcome it, and helped establish a performer as a main event talent from that point forward. Rarely has a six-man tag featured talent from wXw, WWE, Big Japan Wrestling, DDT, and a founder of a respected shoot-style promotion. And as far as the following months go for wXw, they may never have had such a unique mix of intriguing storylines to look forward to in the months to come. And rarely has there been a weekend in wXw that was so obviously a changing of the guard and putting new talent in the front row, while still counting on established stars to back them up and supplement them as supporting characters. Lucky Kid single-handedly defeated 2017 winner Ilja Dragunov and all the participating RINGKAMPF members, submitting WALTER in the finals in dramatic fashion to win the tournament this year. Lucky (real name Metehan Kocabasoglu) just turned 26 one week ago but is already a veteran of more than 10 years in the business. The young man from Berlin with Turkish roots originally was looking at a career in soccer and almost got signed to a developmental deal with a big team, which fell through due to a last-minute knee injury. When a friend from his school, Cem Kaplan, told him about wrestling training, he figured he'd try his luck at that. Lucky trained at the GWF wrestling school in Berlin and was a mainstay there for many years. He teamed with Kaplan until 2014 and then started teaming with fellow GWF mainstay Tarkan Aslan. It was this team, the Young Lions, that first brought him to wXw in 2015. And in 2017, they became regulars on the roster. Upon their re-debut in 2017, they immediately were founding members of the RISE stable, and in that capacity, dominated storylines all throughout the past few years. Around the same time, Lucky, who also had done two tours with Kaientai Dojo of Japan in 2015 and 2016, started improving more and more and also received additional bookings in the UK, competing for Defiant, Fight Club: PRO, RevPro, OTT, Southside, ATTACK!, and others over the past two years. Lucky is on the smaller side at 6' and 180 lbs, but very athletic, with unique charisma and has a child-like charm to him that endeared him to fans, even when he still was a heel. He probably modeled his in-ring behavior off the kind of crazy hyenas from the Disney movie "The Lion King" and uses a signature expression of "BLAAAH!" in his matches. I would probably compare him best to a young Sean Waltman in terms of size, style, and abilities, as he is a very solid technical worker who also has great speed and flying moves. Besides the tournament, the show also had some unique matches, as WWE's Alexander Wolfe teamed with wXw's Timothy Thatcher & Veit Müller to take on the Japanese all-star team of Daisuke Sekimoto (BJW), Shigehiro Irie (DDT) & Yuki Ishikawa (founder of BattlArts). After the match, WALTER and Axel Dieter Jr. came out and the four original RINGKAMPF members surrounded Müller, who had been trying to prove himself to WALTER and Thatcher in recent months. WALTER went to choke him out, but it was just a playful ruse, as they handed him a RINGKAMPF shirt and formally inducted him into the stable. They all shook Müller's hand and Wolfe left the ring, bidding farewell to Germany for the time being. Thatcher shook Müller's hand but refused to do so for WALTER and Dieter, looking to effectively leave the stable. Later on the card, Dieter returned for a one-time reunion with former tag team partner Da Mack, reviving their old Hot & Spicy theme and defeating wXw regulars Jay FK. Schadenfreude, which as of now consists of Chris Brookes & Aussie Open (Mark Davis & Kyle Fletcher), took on the Lucha Bros. (Pentagon Jr. & Fenix) & Rey Horus (Dragon Azteca in Lucha Underground) in a crazy semi-main event six-man tag. They also came out on the stage after Lucky Kid had won and celebrated with his RISE brothers, but instead of confronting them, just clapped and left. Both Lucky Kid and Thatcher belong to Schadenfreude in Fight Club: PRO, so them being part of wXw now opens all kinds of possibilities, not to mention that they kicked WALTER out of the original group, when Thatcher attacked him a few weeks ago. In addition to these stories, there are others that will eventually play out over the next few months: what will David Starr do to overcome his obsession of beating WALTER? There are possibilities there, including going down the path of a Gargano/Ciampa storyline of Starr eventually dropping his core beliefs in order to achieve his goal. What will the future hold for Julian Pace, who looked tremendous all weekend, including in a crazy brawl at a WrestlingKULT show on Saturday morning and winning a four-way with established stars? He is in a feud with Emil Sitoci now, one of the most talented wrestlers in Europe from the previous generation and working with him will certainly benefit him. What's in store for Marius Al-Ani, who got to beat Alexander Wolfe and got a tremendous rub from it? And how will the next chapter in the story between newly-crowned World Champion Bobby Gunns and former champ Absolute Andy play out, especially as there was some foul play in the title win? Also, how will the signing of WALTER and Ilja Dragunov (in addition to Killer Kelly and Toni Storm) to WWE affect the product going forward? After a slight slump in storyline progression, with an unusual number of holes and quirky transitions, wXw's creative team seems to be back firmly in the saddle and ready to continue pursuing their goal of telling the best stories in the business with a group of talented people. wXw sold 1,341 tickets, which was more than on Friday and a bit less than on Saturday. This was a brutal affair, with Dragunov beating up Lucky and the smaller man showing more heart than brains in trying to fight back. Dragunov wiped Lucky out with a dive into the first few rows of chairs early. Dragunov popped right back up from a Liger Bomb, then went into chopping the hell out of Lucky and hit him with a swiveling lariat for a near fall. Lucky hit a missile dropkick, but Dragunov came right back with a Death Valley Driver into the corner, then followed it up with a Coast-to-Coast and Burning Hammer. Dragunov went for Torpedo Moscow, but it was a ruse by Lucky as he rolled him up for a close near fall. In a cool spot, Lucky went for his handspring back elbow off the ropes -- and Dragunov drilled him with a Torpedo Moscow in the stomach while he was upside down for a super close near fall that had the crowd going crazy. Dragunov rained down Danielson-style elbows on Lucky as he prepared for another Torpedo Moscow. As he was about to hit it, Lucky fell down again. Dragunov was in a rage, screaming at Lucky to get back up. He eventually did, but avoided a third Torpedo Moscow. Lucky avoided him and Dragunov crashed into the turnbuckles. Lucky then hit a 450 splash and picked up the win. The story here was that WALTER is a former mentor and tag team partner of Avalanche, which did nothing to prevent WALTER from displaying "total hardship" on his former protege. WALTER pointed at the 16 Carat sign over the ring, but when Avalanche looked up, he got nailed with a big boot. Avalanche came back with a back body drop, slam, and DRSKR Bomb in an attempt to end the match early, but WALTER reached for the ropes during the pin. WALTER took a Flair bump off the top and a big splash for another two count. They brawled outside, including Avalanche taking a nasty spill over the top and hitting the walkway ramp awkwardly with his elbow and shoulder. WALTER, now seeing a target painted on the arm, started working it mercilessly. After a Fujiwara armbar, WALTER followed up with a huge German suplex and even bigger powerbomb for another near fall. Avalanche went for a powerbomb of his own and slightly collapsed upon execution, but still brought down WALTER safe. He hit another DRSK Bomb, but upon impact, WALTER grabbed his arm for the double wristlock and Avalanche had to tap. Ring announcer Thommy Giessen told us that the next match would be one of the unique bookings made possible on such a weekend. The crowd went crazy for Wolfe and got in a frenzy when he was joined by RINGKAMPF aspirant Müller and founding member Thatcher. The fans got even more giddy when it became clear they would face the three popular Japanese wrestlers. Thatcher coached Müller against Ishikawa, before tagging in himself against his mentor. Sekimoto came in next and Thatcher belly-to-belly suplexed him off the ropes. After some more tags, Wolfe hit a German suplex on Irie. Irie blocked a sunset flip by Müller and then piledrove Thatcher on top of him in a unique move. Sekimoto put Müller in the Torture Rack, as Ishikawa locked Thatcher in an Octopus Hold, but Wolfe came in and broke both up. Müller actually picked up Sekimoto for an airplane spin, which left both men dizzy. More tags were made -- until Sekimoto hit another German on Thatcher and Irie hit the Beast Bomber for the win. After the match, WALTER and Axel Dieter Jr. came out to introduce Müller into RINGKAMPF, as mentioned above. They had a great video package before the match, telling the story and friendship of both women over the past 18 months in wXw. In short, while Storm beat Kelly for the title, they were great friends and a tag team afterwards until Kelly showed compassion for Melanie Gray, who Storm sent packing out of Oberhausen after a loser leaves town match. Kelly picking up the Women's title after winning a non-title three way in Hamburg last month didn't help matters as Storm went off on Kelly, telling her she'd be nothing without Storm and that "Killer Storm," their former team, was over. Kelly was really over as a face and Storm was booed like crazy. They did the Frye-Takayama spot early and Storm missed a hip attack but hit a headbutt. Storm threw her to ringside and set up Kelly for another hip attack on a chair but missed and crashed into the chairs as Kelly moved. Storm then threw her into the stairs anyway and wanted a countout victory, but Kelly was back in by five. Storm hit three consecutive Germans and went for a hip attack in the corner, but Kelly escaped, and as they battled on the ropes, managed to trap Storm in a spider dragon sleeper. They brawled up the ramp and Storm hit a Storm Zero piledriver at the entrance area, but Kelly made it back into the ring in time. Storm pulled out Kelly's mouthpiece and put it in her own mouth, then hit a dropkick in the corner. Kelly rose up, hit a head kick, reclaimed her mouthpiece, and hit a corner dropkick of her own. Storm hit another German and another Strong Zero, but Kelly managed to kick out, much to Storm surprise. Storm ran into a Death Valley Bomb by Kelly but also kicked out at two. Kelly went to hit more dropkicks, but Storm managed to cradle her off an attempt and picked up the narrow victory. Jay FK came out and complained about not being featured enough this weekend. They claimed they would now stop the show and turn it into a meet and greet with them. Karsten Beck came out and told them he had two opponents for them ready. "Nordish by Nature" hit and the crowd exploded, as Axel Dieter Jr. and Da Mack appeared, reforming their successful team, Hot & Spicy, for one night only. Skillet attacked Dieter right away, but he was quickly overwhelmed by European uppercuts. Mack was in and got distracted by Kaspin, resulting in Skillet hitting him from behind for the quick advantage. Skillet had Mack on the ropes, but he got pushed off and hit with a flying kick, allowing the Mackster to tag out to Dieter. Dieter managed to hit a double blockbuster from the top on both Jay FK members. Hot & Spicy then hit Pattuse, their double enzuigiri finish, for the victory. This was a great feel-good moment on the show. This was an insane match with way too much happening to describe here. The semi-main on day three always has a crazy tag or multi-man spotfest match, but this one just might have taken the cake. Some highlights: Aussie Open hitting a double-team GTS on Horus, followed by dual superkicks. Fenix hitting a huge tope in the crowd. Pentagon assisting a super dropkick by Horus, who ran down the ramp and got propped up by Penta. Horus with a standing Spanish Fly on Fletcher, followed by a springboard cutter by Brookes, followed by a superkick by Penta. A Gold Coast waterslide by Davis with a simultaneous tope by Fletcher. A triple superkick by the lucha team, followed by a pop-up tope con giro by Horus to the outside, followed by a top rope senton by Fenix to the outside, followed by a tope con giro by Penta on the outside. A super Canadian Destroyer from the top rope from Fletcher! The finish came from a triple superkick by Schadenfreude, followed by an Aussie Arrow on Horus, a pull-up piledriver by Davis, and a Praying Mantis Bomb for the win. Just watch it when it comes out on VOD in a few days. Intense atmosphere at the start, as Lucky avoided a charge but quickly got murdered with chops, a sleeper hold, and a big boot. His face was rubbed into the mat and he was thrown to the outside. Lucky managed to flip over on a German suplex, then sent WALTER to the outside and feigned a tope. He then connected with a springboard dropkick as WALTER went back inside. Lucky followed with a tope con giro. WALTER, ever the bully, then suplexed Lucky onto some chairs. Lucky hit a dragon screw as WALTER went back into the ring, but he got caught in a Boston crab, crossface, and Fujiwara armbar in quick succession. WALTER started working over Lucky's elbow in the armbar. WALTER kept pummeling the smaller man, who caught him in a small package for the near win. WALTER transitioned a Gojira clutch into a powerbomb for another two count. They brawled on the top rope, and Lucky managed a rana in mid-air off a top-rope powerbomb, which was an amazing visual. Lucky hit an Asai DDT and went for a crossface, but WALTER managed to stand up and pull Lucky into position for a tombstone piledriver for another near fall. WALTER got Lucky on the top rope once more and wanted to go for a butterfly suplex, but Lucky escaped and turned it into a powerbomb of his own. Lucky once more tried La Mistica into the RISE Lock, but WALTER powered out and turned it into a huge uranage slam for another near fall as the crowd willed Lucky to survive. WALTER locked in another Gojira clutch, but Lucky managed to roll back on it for a near fall, then hit a number of running double foot stomps, two consecutive 450 splashes off the top rope, and finally locked in the RISE Lock (crossface) in the middle of the ring, until WALTER tapped out to a huge pop! Lucky couldn't believe he actually won, needing a few more minutes in the corner to comprehend what just happened as his RISE brothers, Ivan Kiev and Pete Bouncer, came into the ring to celebrate with him. WALTER begrudgingly shook his hand before leaving. After a few minutes of celebration, Schadenfreude came out on the stage. But instead of confronting RISE, they just clapped for Lucky and left. A great ending to an amazing weekend of wrestling in Oberhausen. - Crowchester vs. Lucas Robinson went to a no contest when Al-Ani attacked both men. This led to Julian Pace, Emil Sitoci, and Leon van Gasteren running in. Fun comedy match with some sexual stereotypes. This was the best match on the show, with all three looking excellent. This was a showcase event for some smaller German promotions and schools.